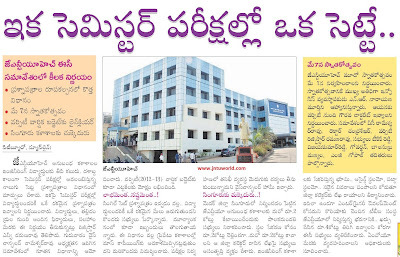 Good News For JNTU-HYD affiliated college Students. JNTUH decided to change the question paper pattern i.e., keeping full stop for 4 sets question paper pattern. From this semester exams single set (Same question paper) question paper pattern will be implemented. This decision was taken after considering the requests from students & their parents by registrar N.V Ramana Rao after the meeting held on thursday with Vice Chancellor Rameshwar Rao. We will alert u if yet any official notification is issued. We are expecting the official notification to be released soon. Source : Sakshi News paper.